There is a quadrillion-dollar powder keg sitting at the center of the world financial markets. If the economy keeps on it present course, it will be ignited into a financial supernova. This is the result of the combination of greed and computers -- derivatives. Derivatives are financial instruments whose values are derived from something else such as assets or indexes such as interest rates or the stock market. They are used to mitigate or hedge the risk of economic loss from the changes in the value of the underlining asset or index. Derivatives can also be used to acquire risk rather than insure against it to speculate, betting that the party seeking insurance will be wrong about the future value. The derivative market is largely unregulated with no loss reserve requirement thanks to Clinton’s 2000 Commodities Future Modernization Act. Total world derivatives are $1000 trillion or 19 times the total world GDP of $54 trillion. 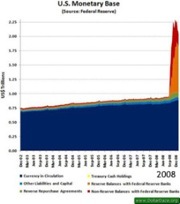 Over-the-counter derivatives total $684 trillion of which 67 percent are interest rate swaps. Exchange-traded derivatives total $344 trillion. Interest rate swaps are the largest derivative powder keg waiting to blow the world financial markets to supernova. Interest rates swaps are maintained by the spread between the Fed funds and prime mortgage rates. At the end of 2008 Fed funds were at 5.25 percent while mortgage rates were six percent, yielding a spread of less than one percent. To increase the spread to avoid interest rate swaps from imploding, Wall Street bankers took advantage of the U.S. people’s ignorance of economics. People look at prices to gage inflation, when it is really the money supply that controls inflation. Prices are the symptom, not the cause. They ran up commodities for a time and then brought about a dramatic drop in prices later to give the perception that deflation might be setting in. This is how they justified the near-zero interest rates we see now, which can yield a huge spread of about five percent, which is more than five times what was available before all the trouble started. Already we have seen the subprime derivatives, large insurers, and investment banks implode. Wall Street CEO’s lied through their teeth about the condition of their insolvent companies right up to the day they went bankrupt. The losses are going directly to the people through the bailouts. But the $700 billion bailout to absorb banking toxic waste plus the new $787 stimulus package will ignite hyperinflation and bring double-digit interest rates. Because of the world economic downturn, foreign nations have fewer dollars to buy U.S. Treasuries with. Tax revenues are plummeting world wide as earnings collapse. The Fed and the Treasury are using debt instruments that are being monetized. In other words, creating money out of thin air (U.S. Monetary Base chart). This is immediately very inflationary, and is how the fuse to interest rates swaps is being lit. Inflation at the wholesale level surged unexpectedly by .8 percent in January well above the 0.2 percent increase that economists had expected. Take JP Morgan Chase for example, and their $90 trillion derivative portfolio. Let's say that $50 trillion are in interest rate swaps. If they have even a mere two percent overhang (loss) where they have to pay out variable rates of interest on two percent more of their total interest rate swaps than the portion of swaps on which they are, by contrast, receiving variable rates of interest, they could suffer horrendous losses that could easily put them under. Let's say that everything balances at a four percent spread as described earlier. But now rates move to 14 percent because of hyperinflation and everyone ignores the rates set by the central banks sending LIBOR and Treasury bill rates to unheard of high levels. Two percent of $50 trillion is a trillion dollars of overhang loss on which you are now paying out 10 percent more, and 10 percent of one trillion is $100 billion, a killer loss. That would put them under. Even an overhang of only one half of one percent pumps out a loss of $25 billion. And what if the overhang is five percent, or 10 percent, or 20 percent? With an overhang of 20 percent, we hit one trillion in losses. And this is only one bank! Our capitalist global casino is a house of cards. If the economy continues to sink, credit default swaps will be the first to blow as we move from hundreds of billions to trillions in corporate quarterly losses. This triggers more deficit spending, which ignites more inflation which lights the fuse to the interest rate swaps supernova. Greater financial risk plus plummeting earnings per share pushes stock markets lower, which increases pension deficits and defaults (S&P 500 Corporate Earnings chart). As mentioned in my previous essay, America’s 500 largest companies have a deficit of $200 billion in their pension plans. If the Dow hits 4,000, pension deficits would rise to $400 to $500 billion. Retirees lose their pensions and stock market investments. Many will be left with just their FDIC insured deposits if the government does not default. 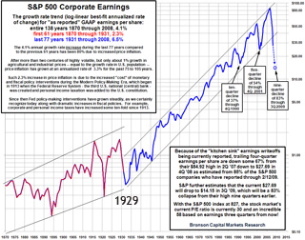 Standard and Poor’s estimates that by Q3 2009 S&P 500 earnings will have collapsed by 83 percent from their high in Q2 2007. This will push the Dow to between 5000 and 4000 over the next year. Japan’s GDP, formerly a major buyer of U.S. securities, shrank at an annual rate of 12.7 percent from October to December 2008 after contracting for two previous quarters. The UN International Labor Organization estimates that 50 million workers will lose their jobs worldwide in 2009. About 20,000 major banks worldwide collapsed, were sold, or were nationalized in 2008. An estimated 62,000 U.S. companies are expected to shut down this year. The triple whammy is that during the great depression about half the Americans lived on farms, but today only two percent participate in their food production. The big picture for me is that I do not see another Internet boom on the horizon to pull the world economy out of further decline. The Obama stimulus bump will last six to 12 months, but then wear off. Even if we avoid further financial meltdown, starting in the next two to four years peak oil is going to start building relentless downward pressure on the world economy. The best solution is to start powering down to a steady-state economy, and build community gracefully now while we have the resources. Today you can plant your first backyard garden and still go to the grocery store if it does not work out.